XAMPP is a free and open source cross-platform web server solution stack package developed by Apache Friends, consisting mainly of the Apache HTTP Server, MariaDB database, and interpreters for scripts written in the PHP and Perl programming languages. If you use xampp, you probably know how easy is to create and maintain databases with the integrated module of phpmyadmin. You may find easily to work with PHP, but, if you have .NET knowledge you can start working with it too. MySQL offers a connector a easy connector that will allow you to execute queries to phpmyadmin from your winform. In this article we'll learn how to access a database created in phpmyadmin using winforms in C# easily. 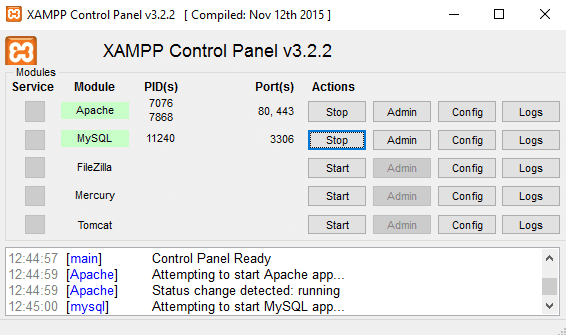 XAMPP Distribution (we'll assume that you know how to use mysql and xampp). Add the reference to the MySQL connector to your winform project. Create your database (ignore if you already have any) in MySQL with PHPMyAdmin. 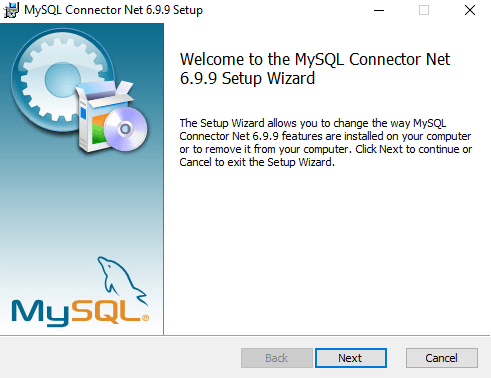 To get started, you need obligatory the .NET MySQL extension installed in your system as we need to add the reference in our project later. You can choose one of the latest version in the official website of MySQL. 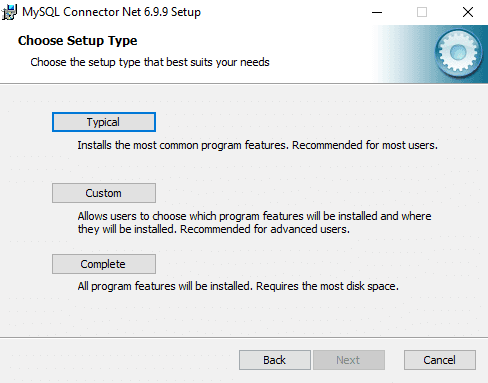 You can choose wether a complete installation or typical. 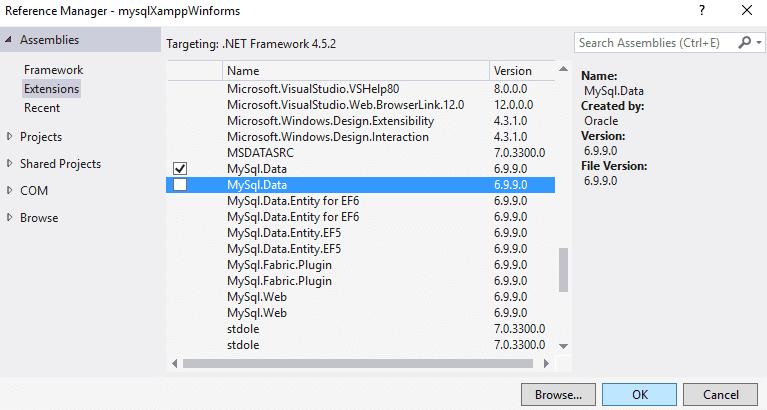 After the installation, we are going to proceed to create an empty Winforms project in Visual Studio as you usually do. Now we need to add the reference to the mysql connector in our project. 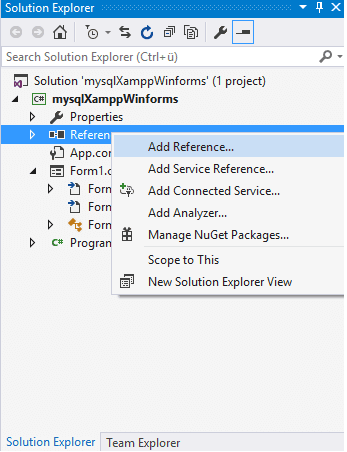 Locate the solution explorer in the right top corner of Visual Studio when your project is open, use right click on References and then select Add Reference from the context menu. In the shown menu, navigate to Extensions and select the checkbox from the list the MySql.Data (MySql.Data.dll) and then click on OK.
Now we'll be able to connect to execute queries to MySQL with C#. As mentioned before, we assume that you already have Xampp installed on your system and you know how to use it. First, do not forget to enable the apache and mysql services in the xampp panel (which is recommended in Administrator mode). Now navigate in your browser to http://localhost/phpmyadmin and go to the databases area. Create a database (in this example our database will be test) and create a table named user. Remember to enable the autoincrementable option to the id field, otherwise you'll need to add an id everytime you insert a row. Now that our database "test" contains at least one table "user", we can start executing queries. // You can ignore the database option if you want to access all of them. // 127.0.0.1 stands for localhost and the default port to connect. // Let's do it ! // Show any error message. And that's it ! Basically, you just need to change the query and start testing. You can read more about the connection string and all the available properties here. Note that we'll use a simple listView component (with 4 columns : id,first name, last name and address), 3 textBox and 2 Buttons. // Ops, maybe the id doesn't exists ?